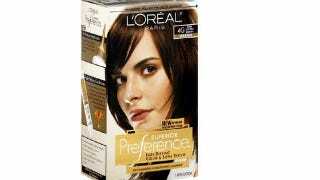 A British woman is in a coma after collapsing while dying her hair with L'Oreal Preference hair dye. Doctors think she's experiencing a severe allergic reaction to a chemical in the dye. The BBC reports that the woman, 38-year-old mother of two Julie McCabe, has reportedly dyed her hair every six weeks for the last several years and, until now, hasn't experienced any problem. Last month, while rinsing the dye out of her hair after leaving it for the recommended amount of time, she began having difficulty breathing and collapsed. Her husband rushed her to the hospital, but by the time doctors were able to revive her, her brain had been without oxygen for so long that she was unable to gain consciousness. She remains in a coma and doctors think she has a slim chance of ever recovering. Doctors say a severe allergic reaction to a chemical called phenylenediamine (PPD) is to blame for the 38-year-old's collapse and now, her family is threatening to sue L'Oreal. Evidence linking the chemical, found in almost all permanent hair dyes, to allergic reactions, injury, or death is thin. A 2007 paper published in the UK speculated that it could cause allergic reactions in some, but there's no definite link between McCabe's condition and PPD. Her family thinks that years of using dye caused the chemical to build up in her system. L'Oreal is "very concerned" about the incident and has offered to provide samples of their product for testing.